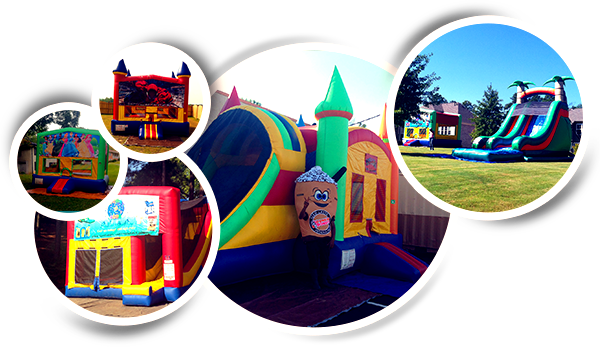 We offer bounce house rentals / moonwalks for different events and occasions in various shapes and styles. 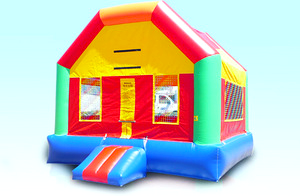 All of the dimensions of our bounce house rentals are 15 x 15 x 15. This provides a large area on the inside of our unit for kids to bounce, hop and run around inside. They also come equip with a basket ball goal on the inside. These units appeal to all ages…both boys are girls. These bounce house rentals are referred to as bounce house slide combos, bounce house combos, and/or 4 in 1 combination units because they fuse a jumper and slide together. They generally have a 13 x 13 jumper/ moonwalk with a 13 foot slide. They have four activities for the child to perform while playing in the jumper. The child can jump, slide, climb, and shoot hoops. We can attach a pool to some combination units if you would like to rent it wet which would make it a 5 in 1 Combination Unit. Some of these bounce house rentals can be rented with a theme such as Spider Man, Disney Princess, Mickey and Minnie Mouse and Paw Patrol. Our 70′ Backyard Obstacle Course is loaded with 9 different obstacles to navigate through, including a 6 foot obstacle tunnel. The tunnel passes right through the center of the Slide to the other side. There you will find 3 more challenging obstacles to go through before you enter the ladder climb which leads you to the top of our 16′ slide. From the top of the slide, you’re guaranteed a thrilling ride down to the bottom with this bounce house rentals. Looking for that perfect water slide rental??? Well Look no further! This slide is sure to keep your child cool for the summer. This 18’ foot slide comes with a 10’ pool and is perfect for any occasion. You won’t find a more beautiful inflatable water slide anywhere. We clean our Bounce Houses Rentals / inflatables after every use so you will always get a clean unit from us. We take pride in the fact that we can deliver clean inflatables for you to enjoy at your events. The best compliment you can give us is to recommend us to a friend! • We deliver, setup and pickup, which means no hassles for you. We are open 24 hours a day online with our state of the art reservation system. Call us today 404-346-4151 or book your rental online at www.haveaballpartyrentals.com to Have A Ball at your next event!